Hi there everyone! Are you enjoying the February Creative Cafe' kit? So much fun inspiration this month! First Layer: 5&1/2" by 1&1/2" piece of white pearl cardstock, layer with 5&1/2" by 1&1/4" piece of light pink pearl cardstock, and layer 5&1/2" by 1" piece of heart doodle pattern paper. Glue all strips together using Scrap Happy Glue and glue to left side of card (leaving a small strip of black card showing). Center Panel: 3&3/4" by 3&1/4" piece of light pink pearl cardstock matted on a 4" by 3&1/2" piece of dark pink pearl cardstock. Add a 3&3/4" by 1" piece of love script pattern paper, matted on a 3&3/4" by 1&1/4" piece of white pearl cardstock to the left side after tying a bow of red seam binding around it. Stamp sentiment in Black Tuxedo ink, and cut into banner shape (approx 1&1/2" by 2&3/4") and mat on dark pink pearl cardstock. Glue under bow on card. 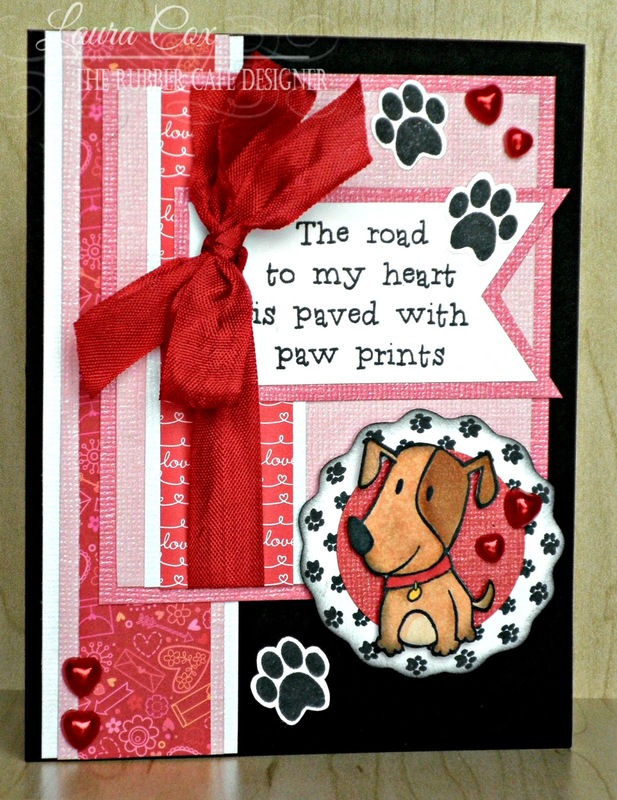 Stamp pawprints using Black Tuxedo ink, and fussy cut out. 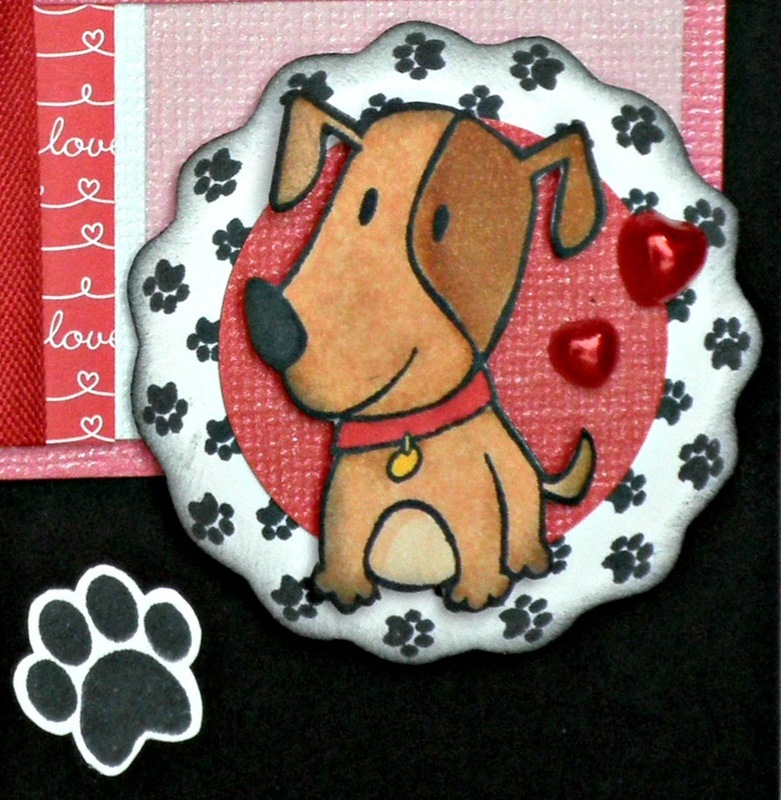 Stamp pawprint ring and fussy cut out also--brush edges with Black Soot Distress Ink if desired. Then stamp puppy, color using markers. To finish, punch out 1&1/2" circle of red pearl cardstock, glue to pawprint ring, then foam tape puppy to this piece and foam tape to bottom right corner of center panel. 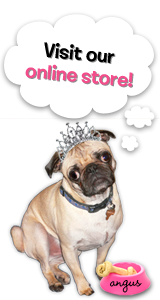 Add random pawprints and pearl hearts. Thanks for stopping by the cafe' today.....and come back soon for more ideas with this fantastic kit!